Hyrule Warriors is now just weeks away from release in the West, a title that stunned fans upon its reveal in December 2013 and is eagerly anticipated as a rare spin-off to The Legend of Zelda. Its shock factor when revealed was down to its key feature — it's a crossover of the Dynasty Warriors and Zelda franchises, with the former driving much of the core gameplay. Koei Tecmo has been in the privileged position of taking one of Nintendo's most beloved franchises in a new direction. While it's tempting to conclude that this balance between the two franchises was always the plan once the project was agreed, that was evidently not the case. In an interview with Legend of Zelda series producer Eiji Aonuma and Koei Tecmo's Yosuke Hayashi to be published on Nintendo Life later today, the key role of Shigeru Miyamoto in that fundamental design decision is made clear. Aonuma-san said the following. At first, when Hayashi-san approached me, he wanted to make this title closer to a Zelda game than a Dynasty Warriors game — that extended to having boss battles in the dungeons and [having] certain characters in the game. However, Mr. Miyamoto came along and up-ended the tea table, saying, “No, that should not be the case. What we’re doing here is grafting Zelda onto the Dynasty Warriors experience.” It was a reversal of the original proposal from Hayashi-san, which was adding elements of Dynasty Warriors onto the Zelda franchise. It ended up being the other way around based on Miyamoto’s direction. When asked further regarding the challenge of blending the two franchises together, Hayashi-san explained that including enough Zelda content to remain faithful to the series was a key task, while also ensuring the experience felt new and unique. This relates a bit to when Mr. Miyamoto stepped in to overturn the tea table. It was really trying to strike that balance of making a game that Zelda fans will enjoy that is different from a typical Zelda game, that has enough elements that people will enjoy but also not losing Zelda fans. We ourselves are Zelda fans as well, so we had to ask ourselves the question of what is it that makes a Zelda game, and how many of those elements do we need to include. Up until the very end, we kept adding different elements to the game until we struck a balance that we were happy with. 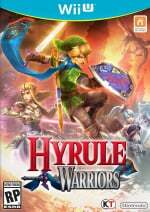 With a sizeable cast that boasts a range of unique move-sets, along with locations and scenarios instantly recognisable to Zelda fans, Hyrule Warriors certainly achieves a degree of that fusion that Koei Tecmo targeted. The balance of utilising Dynasty Warriors gameplay and mechanics as the core aspect, it seems, is courtesy of a high-level decision by Shigeru Miyamoto. Let us know what you think of this in the comments below, and be sure to check out the full interview in which we discuss Hyrule Warriors in detail. I'm kinda glad they took that different approach with this game. I want Zelda to be Zelda and in the end this is exactly what it was meant to be. Good design decision on his part. I did read on Wikipedia that Miyamoto enjoys rearranging furniture in his house. Now I know what that meant. Also, the guy has some awesome clothes. Reminds me of when Miyamoto approached the Star Fox team. He just came in and said, "No! This is how we will do it!" And of course, we all know how great Star Fox became. I couldn't find a good GIF. Now flip the cards Mr. Miyamoto and make a card game-like (hearthstone) but with amiibo as the "cards". This was a very good decision. It's important to make very clear that this is completely detached from the main Zelda series, and shouldn't be taken as seriously. It's like Smash Bros. It plays nothing like any of the characters' original games and that's fine, it's great just to have fun playing with those characters. I am glad Miyamoto insisted that they graft zelda assets into a Dynasty warriors game. With the new WiiU zelda set to come out next year Nintendo didn't need a game too similar to cannibalize sales of the next (presumably) great Zelda game. This is more of a warm up act to whet the fan's appetites. Who cares if cynics brush it off as Dynasty Warriors in Zelda clothing, this is something made by people who care about wiiU for wiiU owners out there. I never felt Dynasty Warriors was a good game to start with. Reskinning it to be a Zelda game isn't going to sway that opinion. I remember playing videogames in the dark, untill this man said something like "let there be light". And there was light. Or am I mixing up stories here? My memory is rather vague at times. Anyway, I like it that they kept it womething truely separate, Zelda fans like me will go wherever Link goes, or Ganondorf takes princess Zelda, anyway. Or where moons treathen to fall, moblins roam freely, things are devided in three and spread across lands, or eight items are hidden in dungeons. It doesn't need to be ALL of the above. That's why Miyamoto-sensei is a god. For one KT can't make a Zelda game... play to your strengths. Make a Warriors game and salt it with Zelda rather than trying to one up Nintendo and have warriors elements. Plus that keeps them from reinventing the wheel. Sure it won't sway non warriors fans but it would most assuredly have alienated fans that were looking for a pure Zelda game if that was what KT tried to make. This way folks that are zelda but open minded get a chance to try a new genre (I'm sorta in that camp. I've played a few warriors and i don't dislike it but I'm not chomping at the bit when the warriors games come out). Zelda and Warriors fans get a win win. Hopefully either there will be a second one or DLC will keep the game going strong. This image make me laugh much harder than i should! Can somebody photoshop a table into that pic? Oh, 80's anime... What anime is that still from? Nintendo is the odd ball of gaming, and I hope they continue to be different. They have broke the mold of traditional gaming, and now they are starting to break their own traditions of being predictable (well predictable within context). Amazing idea! Good call on Miyamoto's part. You want a spin-off to feel different and unique yet a bit familiar, not the other way around. Sometimes you just have to step in and say "no, this is how you should do it. Do it this way". I have mixed feelings. Warriors game with Zelda in is a very safe and conservative game and comes accross as cheap and dull. It feels like the developers want to give something more ambitious a go. In a way the creativity was stifled but at the same time Nintendo was the one taking risks (if it turned out too similar or bad or whatever, a proven game is a safe option) hence why I'm not sure how to feel. Miyamoto is not all-wise though. He wanted Link Between worlds to be another Link to the Past port for instance (if it came out lie they I wouldn't have bought it as I already have that). 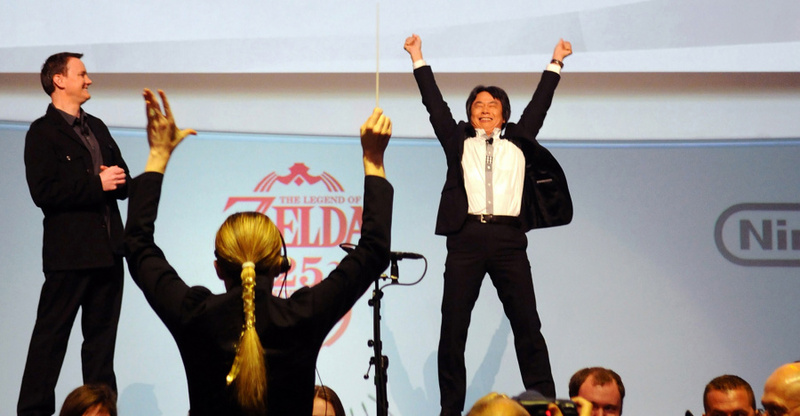 Miyamoto rules. As usual, he was completely correct to shift back the balance towards DW. Were these statements made recently? I don't know, it sounds to me like this is Miyamoto and Nintendo blaming the Dynasty Warriors and Tecmo-Koei to cover for the low sales of Hyrule Warriors in Japan where everyone expected it to do best. Maybe we'll see a Tecmo Koei spokesperson blame Nintendo fans or the Zelda franchise itself next. I think making it too much like Dynasty Warriors was a bad idea and probably born out of expediency and economic considerations. They really should have made something entirely new utilizing the talents of both developers, instead of a Zelda themed Dynasty Warriors. Hmmm. Release weird unique system - then proceed to make really safe, predictable games for said unique system. No more franchise cash-ins for a while please. @Action51 These are from our interview conducted in August. The full shebang will go live in a few hours. @Action51 I didn't take the statements as blaming either party. Merely keeping the crossovers playing to the dev that is doing the heavy lifting's strengths. I'm sure the new Dragon Quest Heroes game on the Ps4 is going to be much the same. I don't think that anybody thought the game was going to sale systems but that it would tap into two franchises that would never mix normally that many people like. I think I would prefer the original proposal. I bought Dynasty Warriors 8 : Xtreme Legends Complete for £20 and I don't like it - a Zelda reskin in not going to change that. (The good parts of it combined with the best parts of Zelda would be something totally different). I really like the last boss bit of Links Crossbow Training. @Ryu_Niiyama Capcom did fine making Zelda games. (In fact the stories are much more memorable and the games are interesting in that everything is not exactly the same as always). I totally respect your opinion about that but I personally found that I didn't enjoy minish cap or the oracles games as much as the ones made by Nintendo. I know my opinion is unpopular I'm just mentioning it so you understand my frame of reference for my comment. @Extremist Miyamoto wanted no bosses at all in Links Crossbow Training. (The people making it wanted loads) and the boss that is in it is the best part of the game. I think he might have wanted all the really boring bits only like the targets. @JonWahlgren - Was it before or after the release of Hyrule Warriors in Japan? Listen, I love Miyamoto, and I think the guy is a living legend, but even living legends can do PR and spin and cover their butts when a project doesn't live up to expectations. I just can't understand the thinking behind Hyrule Warriors ultimate end product, The Legend of Zelda franchise gave them the opportunity to tone down the generic swarms of mindless, helpless, sword fodder, but they managed to somehow make it worse by making all your foes small and dopey looking little beasties. When I watch the game in action, I can't help but think the heroes or Hyrule are merciless super-villains wiping out entire tribes of these hapless little critters with their flashy, overkill attacks. Should had just being called Dragon Warriors again since it's going to be a Warrior-like title anyways. Going to hold judgment of this decision until I actually play the game on the 26th of this month. @retro_player_22 - Wow that looks so much better then Hyrule Warriors...sure it's still mindless button mashing, but look...variety of enemies, colorful, stylish designs, nice backgrounds that don't have that typical Warriors murky, dull, flat appearance. @Action51 After it's release in Japan. In the full interview, the two mention the Japanese Miiverse response to the game's release. @retro_player_22 I am looking forward to Dragon Quest Heroes. It is the game that is getting me to buy a Ps4 (I'm a sucker for DQ... any DQ). Nice Kisuke avatar by the way. That Dragon Warriors video is mostly cinematics. :/ The gameplay stuff is short and super active so you can't see the background detail very much. It's pretty deceptive because the cinematics are playing out much like the gameplay does. The decision was a good one. As much as I've seen people on here hoping it was more and more like Zelda what would be the point? It needs a solid separation and it has it. I thought it looked lame at first (never did like that red moblin design) but I get it now and the context of the gameplay has your castle being overrun by hoards of bad guys. It's war. It's a good thing the heroes have super powers because they seem vastly outnumbered and there are many opponents of higher stature scattered throughout. Still, it remains to be seen how the Western audience will respond to it. Sad to see it so inert on the sales charts after such a high famitsu score. Zelda just doesn't do as well in Japan. I blame the famicon disk fragmentation for that and the lack of Japanese interest in Metroid. These guys were more than likely never going to be able to make a game that was quite good enough to deliver the highest level of quality we all expect from an actual Zelda game, or a game we consider an actual Nintendo game, so by turning it basically into a more traditional Dynasty Warriors game with what amounts to a licensed Zelda themed skin it's not so important that the quality comes nowhere near that proper Zelda standard AAAND it adds a different type of game to the Wii U catalogue rather than it being just another Zelda game anyway. So, people can say "We got a Dynasty Warriors game and a new Zelda game..." at some point down the line rather than "We got two Zelda games...". Makes it so the Wii U library is a bit more varied (despite using familiar characters). This way both Dynasty Warriors fans and Nintendo fans bet a fix and Nintendo's franchises don't really get tarnished in the process by what I think looks like a slightly meh game. @JonWahlgren - Just read it, good interview! Well, I have no reason to doubt Eiji Anouma, but it does kinda sound like some post-release spin to cover for something of a disappointing release...that's my cynical opinion. Well I'm busy unlocking all the characters in Warriors Orochi 3 and I'm hyped whatever anyone else says. I'll be getting this game on payday for sure! @Action51 Thanks for the kind words! I'm really interested to sit down with this game just to see what it's all about. I think the Zelda series could use a good shake-up from time to time, even if it is just a side-step like this one. I'm so using the phase "can I up-end the tea table" in my next meeting. @Starwolf_UK I just was listening to a podcast archive and heard a discussion from 2011 regarding those statements. They were actually more along the lines of, "Depending on who is in charge of the development, I may prefer them just to make a port of 'LoZ: aLttP' rather than a direct sequel." I think it is a sign of his wisdom to know that a cherished game in the franchise couldn't be messed with by just anyone. In the wrong hands what because 'A Link Between Worlds' could have been disastrous. @RantingThespian It was never as good as Rogue Squadron. I prefer Rogue Squadron 2 to any Starfox. And even Rogue Squadron 3 to Starfox Assault. (Not sure about Starfox 64 and the original Rogue Squadron not played it recently enough to remember). @Kirk That is not important. Trying something new is. He needs to flip the tea table with Wii U. @gatorboi352 Depends whether he is a large part of the cause of that or not. 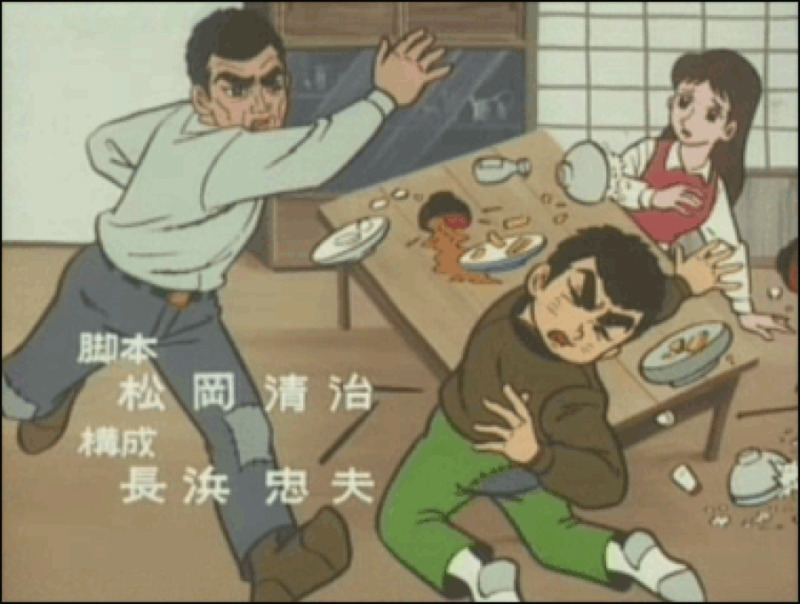 A scene from the 1968 anime adaptation of the classic manga Kyojin no Hoshi, during the end credits of an episode. How acceptable. Sounds like Miyamoto did upend another wrong table! I would have loved some puzzles in it, but this doesn't seem the case. On the other hand, I guess they didn't want to make a game that was to similar. Otherwise it would defeat its purpose a bit. Ah well, I try it out for myself. But while I love all the characters and wild moves, I fear it will get repetitive rather quickly. Especially if there are no puzzles around. I love the puzzles. Also: I don't think I'll will be a great fan of the cheap rock-music either.